The diagnostic criteria of personality disorders are defined in the Diagnostic and Statistical Manual of Mental Disorders, Fifth Edition, (DSM-5), Section II (APA, 2013). The Personality and Personality Disorders Work Group for DSM-5 proposed major revisions to the Personality Disorders section of DSM-IV-TR. These involved a hybrid categorical-dimensional model of personality disorders (PDs) and a reduction of the PDs from ten to six. This proposal was endorsed by the DSM-5 Task Force, but not by the Board of Trustees of the American Psychiatric Association. Instead, the Board indicated the Work Group’s model be placed in DSM-5, Section III with other items requiring additional research. 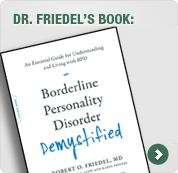 Consequently, the diagnostic criteria for borderline disorder in DSM-5, Section II, have remained essentially unchanged from DSM-IV-TR. The impact of the alternative model proposed by the Work Group has been evaluated by Morey and Skodol (2013). The results of this study suggest that diagnostic rules, or thresholds, could be generated that result in appreciable correspondence between DSM-IV-TR and the alternative DSM-5 criteria. In addition, there appears to be conceptual and empirical justification for diagnostic thresholds within the DSM-5 PDs. another recent study of this issue demonstrated that trait and dysfunction dimensions strongly correlated. However, a recent study compared another instrument assessing the structure of personality with the one used to derive the alternative model proposed by the Work Group (Bastiaansen et al., 2013). The results of this study raises significant questions about the validity and specificity of the model proposed by the Work Group. American Psychiatric Association. Diagnostic and Statistical Manual of Mental Disorders, 5th Edition. Washington, DC: American Psychiatric Publishing; 2013. Bastiaansen, L., De Fruyt, F., Rossi, G., Schotte, C., Hofmans, J. (2013). Personality disorder dysfunction versus traits: Structural and conceptual issues. Personality Disorders. Morey, L., Skodol, A. (2013). Convergence between DSM-IV-TR and DSM-5 diagnostic models for personality disorder: Evaluation of strategies for establishing diagnostic thresholds. Journal of Psychiatric Practice, 19(3), 179-193.